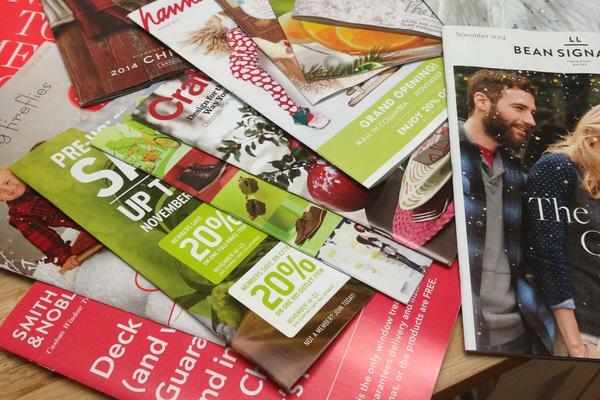 The number of catalogs mailed in the U.S. peaked in 2007, according to the Direct Marketing Association. It's come down since then, but last year it reached 11.9 billion. Many things made with paper have become relics because of computers and the Internet: the Rolodex, multivolume encyclopedias, even physical maps. Now take a look in your mailbox or somewhere around your house. There's a good chance you'll see a shopping catalog, maybe a few of them now that it's the holiday season. "I ignore them," says Rick Narad, a professor at California State University, Chico. "I get them in the mail sometimes, and they don't make it into the house. I walk past the recycling bin, and they go right in." So why, in the digital age, are they still around? "Consumers really still love looking at catalogs," says Bruce Cohen, a retail private equity strategist at the management consulting firm Kurt Salmon. The company published an article called "Is the Catalog Dead?" and the answer was a definitive no. The number of catalogs mailed in the U.S. peaked in 2007, according to the Direct Marketing Association. It's come down since then, but last year it ticked up again to a whopping 11.9 billion mailed to addresses around the U.S.
"And what's interesting about that is you even have purely online companies starting to experiment with printed catalogs," Cohen says. So the death of print is highly exaggerated, at least when it comes to shopping. Mary Winter, a Binghamton, N.Y., resident who works at a Guitar Center warehouse, says she loves catalogs; she enjoys marking them up, and the tactile sensation of thumbing through them at her leisure. "I typically go online and order them and order whatever I'm getting," she says, "or go into the store because it's a little faster, but I still get my ideas from the catalogs." Sue Johnson, a U.S. Postal Service mail carrier in Bay City, Mich., has what you might call the 360-degree perspective. For 28 years she hauled catalogs and other mail in a satchel. "It builds up the muscles in your arms," she says. "A lot." Sometimes she would hand people their catalogs, and they would toss them out right in front of her. But when Johnson curls up on her couch at home, it's a different story. "I'll sit here and read catalogs for hours and just look at stuff," she says. "Stuff I either wish I had, or maybe something will give me an idea to make something." Maybe you're one of the catalog haters, but retailers say there are plenty of people like Winter and Johnson. "We look at them less as tools and more as magazines for our customers," says Felix Carbullido, chief marketing officer at Williams-Sonoma. "They've become more editorial. They've become more of a sourcebook of ideas." Those aren't just fluffy marketing words. A Williams-Sonoma analytics team crunches data to help determine who's most receptive to catalogs, their size and their content. Versions are tailored to a customer's purchasing history. Carbullido says the payoff is evident at the brick-and-mortar stores. "Our customers come in with the catalog dogeared and refer to the catalog as 'this is the style of my home that I'm looking to achieve,' " he says. That style you've seen portrayed in high-end catalogs is often a tableau: maybe it's a couch, a bookcase, a couple of rugs, plants, sunlight streaming into a casually elegant room. Even if you're not buying, the retailers want you to keep dreaming. And that's one reason the catalogs keep coming. A lot of things have been killed off by the Internet, like the Rolodex, multivolume encyclopedias, paper maps. But somehow, shopping catalogs continue to survive. Why? Here's NPR's Uri Berliner. URI BERLINER, BYLINE: Maybe you think we at NPR assign stories after extensive research and data analysis. Sure. That definitely happens. But sometimes it's more like this. My colleague Cara Tallo sent an email that basically said, what's the deal with catalogs? And she attached a picture of all the shopping catalogs she received in a single day. So we counted them. CARA TALLO, BYLINE: Thirteen. Fourteen. Fifteen. Sixteen. But you know what? One of these was a flyer. Full disclosure - we should omit this. TALLO: Oh, my gosh. Four and a half pounds. BERLINER: Four and a half pounds on a single day. BERLINER: With a 2-year-old, a 6-year-old and a busy job, Cara's just not going to spend a lot of time with those catalogs. But at least she allows them in the house - unlike Rick Narad. He's a college professor in Chico, California. RICK NARAD: I ignore them. I get them in the mail sometimes, and they don't make it into the house. I walk past the recycling bin, and they go right in. BERLINER: Then why do companies invest serious money in a product that often winds up unread, in recycling or the trash? BRUCE COHEN: Consumers really still love looking at catalogs. BERLINER: That's Bruce Cohen of the management consulting firm Kurt Salmon. The company produced an article called "Is The Catalog Dead?" And the answer was a definitive no. The number of catalogs mailed in the U.S. peaked in 2007 according to the Direct Marketing Association. It's come down since then. But last year, it ticked up again to a whopping 11.9 billion catalogs mailed to addresses around the U.S.
COHEN: And what's interesting about that is you even have purely online companies starting to experiment with printed catalogs. BERLINER: So the death of print is highly exaggerated, at least when it comes to shopping. MARY WINTER: I love catalogs. BERLINER: That's Mary Winter. She lives in Binghamton, New York, and works at a Guitar Center warehouse. WINTER: I typically go online and order whatever I'm getting. Or I go into the store 'cause it's a little faster. But I still get my ideas from the catalog. BERLINER: Or take Sue Johnson. She has what you might call the 360-degree perspective. Johnson's a Postal Service mail carrier in Bay City, Michigan. SUE JOHNSON: Kind of where the thumb joins to the mitten. BERLINER: For 28 years, she hauled catalogs and other mail in a satchel. JOHNSON: It builds up the muscles in your arms a lot. BERLINER: Sometimes, she would hand people their catalogs, and they would toss them out right in front of her. But when Johnson curls up on her couch at home, it's a different story. JOHNSON: I'll sit here and read catalogs for hours and just look at stuff, stuff I either wish I had, or maybe something will give me an idea to make something. BERLINER: Maybe you're one of the catalog haters. But retailers know there are plenty of people like Mary Winter and Sue Johnson. Felix Carbullido is the chief marketing officer at Williams-Sonoma, Inc.
FELIX CARBULLIDO: We look at them less as tools and more as magazines for our customers. So that means they become more editorial. They become more of a sourcebook of ideas. BERLINER: Those aren't just fluffy marketing words. A Williams-Sonoma analytics team crunches data to help determine who's most receptive to catalogs, their size and content. Versions are tailored to a customer's purchasing history. Carbullido says you see the payoff at the brick-and-mortar stores. CARBULLIDO: Our customers come in with a catalog dog-eared and refer to the catalog as this is the style of my home that I'm looking to achieve. BERLINER: The style portrayed in high-end catalogs, often it's a tableau. You've seen it - maybe a couch, a bookcase, couple of rugs, plants, sunlight streaming into a casually elegant room. Even if you're not buying, the retailers want you to keep dreaming. And that's one reason the catalogs keep coming. Uri Berliner, NPR News. Transcript provided by NPR, Copyright NPR.